The revolving restaurant addressed some apparently primal desire to dine at a table while moving; if you couldn't walk and chew gum, you could rotate and eat Gulf Prawns. It seems garishly and unmistakably American—after all, it received its clearest early outline via the fertile mind of Norman Bel Geddes, below. But the revolving restaurant's debut actually occurred in Germany, with its first iteration appearing in 1959 in Stuttgart. Civic authorities constructing a television tower were looking for some additional means to wring use from the building, and they found it in food. They put a restaurant in the tower, and in the spirit of postwar West German economic hubris, the Stuttgart Fernsehturm would turn—offering at-table views of not merely one but every possible vista. And the model caught on. Top: The Stuttgart Fernsehturm, AP Photo/Thomas Kienzle. The first revolving restaurant in the U.S., La Ronde, opened in 1961 in Honolulu, atop the Ala Moana Building (it's since been lost). La Ronde was soon followed by the Space Needle, built for the 1962 Worlds Fair in Seattle, and then by a range of North American peers that are likely familiar to you: structures—and their respective restaurants—largely associated with 1960s and 1970s fairs and expositions, from the CN Tower in Toronto, the Skylon Tower in Niagara Falls, and the Sunsphere in Knoxville, to the Tower of the Americas in San Antonio. The Sunsphere in Knoxville, AP Photo/Elizabeth A. Davis. Most European spinning restaurant construction happened at the same time, from the Donauturm in Vienna to the Olympiaturm in Munich. Towers in Cairo, Kenya, the Philippines, and many other locations soon joined the revolving revolution. The Eastern Bloc embraced the gimmick too, most notably in the Fernsehturm in East Berlin and the Ostankino Tower in Moscow, but also more remotely, in Tallinn and across the Central Asian Republics. On the right, Cairo Tower, in 1988. Photo: AP/Makram Gad el-Karim. The basic form of revolving portion of the building was simple: A circular structure containing a platform rotated around a central core, which held elevators, kitchens, and so on, designed to ensure that every table cycled through a view of the surrounding landscape at a carefully calibrated speed. Rotating a floor, as it turns out, isn't particularly technically complicated. Mickey Steinberg, a structural engineer on several notable John Portman hotel projects (the leafy, atrium-laden designs found in many U.S. cities) explained in a recent interview that the engineering requirements of the revolving structure became quite simple. A mechanism perfected by a Connecticut firm called Macton built the "turntables" for most American and several international revolving restaurants (its only competitor even today is the Chinese firm Weizhong, which has dominated Asian construction and is growing rapidly). The pattern was always the same, Steinberg said: "We built a floor and then we contracted with them to build a turntable." The wheeled turntable mechanism in one rotating tower. Image via Behance. The restaurant rests on a thin steel platform, which sits on top of a series of wheels connected to the floor (one Memphis turntable was mounted on tires—but that's Memphis). The propulsion? Frequently, a motor with only about ¾ horsepower, according to Steinberg, attached to an angled steel plate with "wheels on both sides like a clutch." A prominent question was just how rapidly to turn the platform—how fast to patrons want to spin? Macton recommended 40 to 50 minutes for most rotations, which some thought was merely an arbitrary speed. But Steinberg said that the management at one hotel noticed that people would often get off the spinning deck after one rotation at the same place where they got on—to get another cocktail at the bar. So they decided to subtly encourage the speed, adjusting the rotation to a half hour. "If we speed it up we'll sell more drinks because they'll get off quicker," the hotel management reasoned. Patrons did speed up their drinking—but there was also an unforeseen side effect. "They were also getting sick all the time! So they soon set that back to regular speed." Typically, the turntable itself was entirely independent of the surrounding structure; a timeworn diner's test was to leave something on the lip of the unmoving edge of the floor and watch it inch away. Some structures completely separated the static core from the spinning outer ring with a set of windows. Revolving restaurant at Yanggakdo Hotel in Pyongyang. Image: Huseyin/CC. Whatever their exact engineering, nearly all spinning restaurants were designed with a sole, obvious goal: Unobstructed views—the circular, revolving portion is surrounded by curved glass. There was more variety is to be found in the kind of buildings that supported them, though. Most rotating restaurants are like architectural barnacles. They rely on other "host" buildings or natural features to provide the necessary height, concentration of visitors, and a share of the design statement. The host structure or site usually has one of three primary forms: vertical cantilevered towers (the superstars of the genre); commercial and industrial buildings; or mountain tops. Towers build adjacent to tourist-frequented natural wonders like Niagra Falls or expositions like the Tower of the Americas in San Antonio, Texas, served primarily as observation deck, restaurant attraction, and instant landmark. Other towers were first and foremost telecommunications platforms—-revolving restaurants and observation decks were ancillary income generators. Spire restaurants, a series of columns or needles supporting an orb or cylinder, are certainly the best-known type—and the stuff of countless skyline t-shirts—whether they accommodate some other function or exist only for the fine view. Occasionally, these towers culminate in observation structures, like the sparkled microphone of the Reunion tower in Dallas, or the pillared disco ball of the Sunsphere in Knoxille. But spires usually rise through and beyond any restaurants. The towers themselves are typically dull linear or mildly narrowing columns; visual interest is a question of whatever cylinder, globe or discus these assorted javelins seem to have speared. They make for interesting contrastive additions to cityscapes, but are generally a pretty uniform lot. Top: The Space Needle in Seattle. Bottom: The Munich Olympiaturm. AP Photo/Diether Endlicher. The Olympiaturm in Munich, above, is a great example of how a stacking pattern creates visual appeal and interest from afar. The most dynamic spinning buildings have a base that's more than just a pillar. For instance, the lattice frame of the Space Needle makes the tower a rare case of appearing both elegant and dynamic. Occasionally observation structures attempt something more strange; the Kamzik Tower near Bratislava, above, has no central column. Rather, four angled columns run along its corner, an exoskeleton that widens and then narrows again with several clearly separated floors exposed. It looks almost like an Eastern Bloc joke of a building finished non-sequentially that decided to open existing floors no matter how much sky separated them—-and it looks great. More commonly, the revolving restaurants exist as crowns on otherwise uneventful buildings, namely hotels. From Cambridge to Stamford to Baltimore to Jacksonville, the only question for hotel designers seemed to be where to land a saucer on top of an existing slab. At the corner? In the center? Aha wait, the other corner! In only a few cases did designers seem to pay some architectural attention to integrating the restaurant. Several accomplished this by simply building cylindrical structures that naturally mirrored or easily housed circular restaurants at their top. The Cairo Tower and the Kenyatta Conference Center were two such strong cases, using locally-inflected high-rise modernism—from local techniques to materials—to create successful integrated structures. The Radisson Hotel Cincinnati Waterfront is another example, as are several John Portman hotels, including the Westin Peachtree Plaza in Atlanta and the Detroit Marriott at the Renaissance Center (seen in Steven Soderbergh's film, Out of Sight). The Westin Peachtree. Image: James Good/Flickr. Stranger designs crop up elsewhere, such as the Genex Tower in Belgrade, where a spire rises along one office tower volume and is linked to another at its top levels. The third category, mountaintop revolving restaurants, is about the simplest expression of the form, given that their locations obviously don't require much of a built platform to achieve a view. You'll find them in the Alps, in the Himalayas, and even, in the case of the Drehrestaurant Allalin, atop a glacier. The best-known mountaintop restaurant is Piz Gloria in Switzerland, whose claim to fame is its role as Telly Savalas' health spa in the 1968 James Bond film On Her Majesty's Secret Service. The setting was more than coincidental; the production became aware of the restaurant while it was under construction and provided financial aid to get it completed in time for filming—007 logos even emblazon the food. Piz Gloria. Image: Wikimedia Commons. Then there are examples that defy easy categorization. The Garden Grill restaurant at Disney's Epcot turns to an interior view of the "Living with the Land" exhibit. The legendary LA architects William Pereira and Charles Luckman designed the impossibly futuristic Theme Building at LAX, which used to contain a rotating restaurant (naturally!). One ad asked, "Hillbillies? 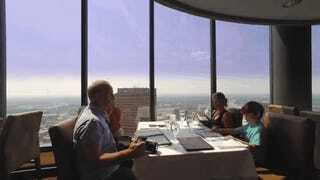 You won't find them dining in a revolving restaurant atop the breathtaking Atlanta Skyline. The revolving restaurant, largely due to its close association with such a distinct cultural moment, now possesses a sheen of irreversible camp across the Western world. Consider even most fictional patrons: Elvis in It Happened at the World's Fair. Peter Cook in Bedazzled. George Lazenby (and not even Roger Moore) in On His Majesty's Secret Service. John Updike's somewhat bemused title character in "Roger's Version." Any survey of vintage advertising conveys a similar and specific sense of place in time. The last American revolving restaurant, at the Stratosphere in Las Vegas, opened in 1996. Yet just as these orbit-themed restaurants, menus, and drink names went into decline in the West, they began to prosper farther east, burgeoning with a very different set of the nouveau riche across Asia and the Middle East. These spinning restaurants, as you may have heard, have rarely won accolades for their food—the Yelp review adjectives are often more savory than the fare. This isn't rare for any kind of "event" restaurant, however, and a few have endured regardless: The View at Portman's Marriott Marquis in New York remains a strikingly successful restaurant. Few of the hangers-on are pretending to be hip. As Mickey Steingarten noted in our interview, "People say they're corny but we're trying to design great experiences—if you have a unique experience then we're happy." Revolving restaurants remain an abiding curiosity that time has simply reshuffled rather than effaced, and there's no denying their novelty. If you don't come around, they certainly will. In about an hour.